Simply put, carbo-loading is when you switch over to a carbohydrate-rich diet in the last days before a marathon as a way to extend your endurance. Done properly, carbohydrate-loading with the proper foods can help you maintain your marathon goal pace longer in the race. The reason this works is that muscle glycogen = the primary energy fuel needed for running = can be loaded up in a runner’s legs to twice their normal level. The more glycogen you have in your legs, the longer you can run. Conversely, when the body depletes its glycogen store in the muscles, marathoners hit the proverbial “wall”. Again, if you can store up as much glycogen as possible in the days before the marathon, you can maintain your endurance longer. Starting on Thursday, you boost your carbohydrate intake to about 70 percent (or higher) of your total calories. Continue this on Friday and of course, on Saturday . The key carbo-loading meal is not the traditional Saturday night spaghetti party. Instead, the key meal is your lunch on Saturday with the final carbo-enriched meal on Saturday night, merely topping off your stores. During this final week, you should be reducing your total volume of running anyway, and with that reduction in your running and the increase in carbohydrates, you will be able to store a greater amount of muscle glycogen than if you were running and eating normally. You will gain some weight (really, just a few pounds), but don’t worry about it. The type of carbohydrates you eat does make a difference. You should go for complex carbohydrates such as pasta, veggies, rice, cereals, fruits and potatoes, rather than simple carbohydrates like cookies, cakes and candy. Protein will not help a great deal on Sunday6, but don’t avoid it. The more protein you eat, the less carbs you can cram in – and carbs are what you need. So it’s an easy choice. When you begin carbo-loading, this doesn’t necessarily mean you have to eat substantially more than normal. (This is a common mistake.) Only the percentage of carbs should be upped, not the total intake. Carbohydrate-loading only works when you’re running an hour or two or much longer. So it won’t make any difference in shorter races, such as a 5-K. If you’re planning to run the half marathon on Sunday, carbo-loading for it is fine but it won’t have as much of an impact as it would in the marathon. Still, carbo-loading is especially useful in a marathon because almost every runner will eventually deplete the muscle glycogen stores. The problem is you can only store a finite amount of glycogen in your muscles – not enough for most runners to complete the 26.2-mile marathon. Most runners will run out of glycogen after about three hours of running. When that happens, you run out of gas and will experience a huge drop in your ability to run comfortably. 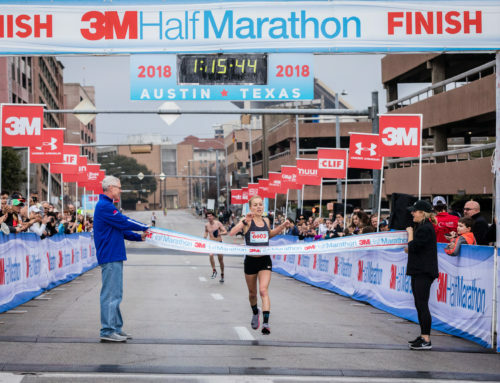 Since few of us can run a three-hour marathon or faster, one way to avoid the dreaded wall is to take on carbohydrates during the race so you don’t run out of glycogen. The best way to do this is either by drinking carbohydrate sports drinks during the race and/or using carbohydrate gels, Gu’s or Shot Bloks. You should plan to drink carbohydrate sports drinks about every 20 minutes of the race. Most marathons have an electrolyte at aid stations such as Gatorade. 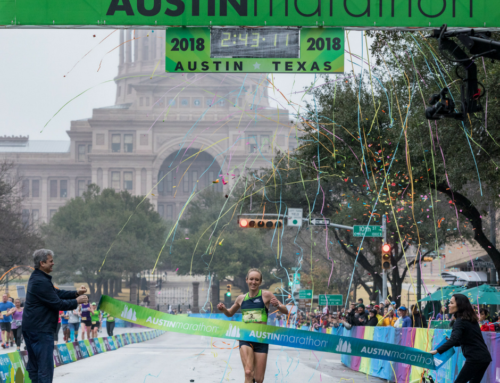 In the Austin Marathon, Gatorade Endurance Formula Lemon-Lime is the drink of choice and it will be distributed at all 17 aid stations along with water. If you plan on using energy gels, so you’ll either need to carry a supply with you or have someone give you a few packets along the course. Most marathoners carry them in pockets in their shorts or clip them onto their shorts. Some running shorts have specially designed pockets in the back for carrying gel packs. When you load or reload, it is also important to drink plenty of water as it helps the muscles absorb the carbohydrates. If you do carbo load and drink properly, you should have plenty of fuel in the long run.